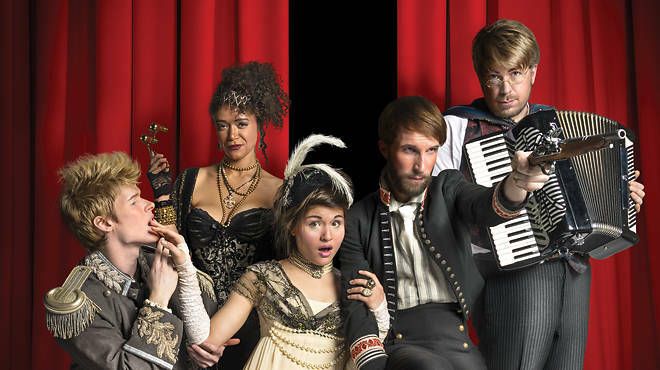 Is ‘Natasha, Pierre, and the Great Comet of 1812’ Immersive Theatre? The cast is equally versatile and savvy. There’s not one member of the cast who doesn’t dazzle with their unique performance style. But it seems like Natasha’s selling point is its innovative theatrical form. Audience members are seated in a gorgeous restaurant/club style space. Each table is decked with small appetizers and a complimentary shot of a vodka cocktail. More comf. ortable seating means a more expensive ticket. I was seated with four other people around a small round table which would really have been better fit for three diners tops. The restaurant decor is lush and filled with plenty to dazzle. The waiters took good care of us and circulated regularly for questions or orders. And the food’s pretty good but portioned rather small when you have to share with four other people (again more food for more money). Before the performance, one of the head waiters informed our table that the show was immersive, but not interactive– so keep your hands to yourselves. Nowadays, immersive theater is very high in demand. Sleep No More basically solidified its success and smaller ‘immersive’ productions have sprouted up around the city (Then She Fell has enjoyed success in Greenpoint). “Immersive” also tends to mean a hefty price tag. Because there’s no hierarchical seating plan as at a regular theater, theatergoers all pay the same price for the same experience (as opposed to different prices for different seats or views of the stage). It’s a more democratic model, and there are no $200 orchestra seats, but the plan means more out-of-pocket for theatregoers who are used to paying $69 for balcony seats and must now pay $110+ for immersive shows. Also, because of immersive theatre’s hot commodity status, there are few discounts floating around (Months into its run, Natasha had some limited discounts and is only now offering $49 student rush tickets, but only on matinees). Sleep No More offers little in price flexibility and every new e-mail I get from the McKittrick Hotel, it seems like their events get pricier and pricier. 1) “Immersive” technically means that something engages all your senses. I guess Natasha does do this by wine-ing and dining us while giving us a show. But how is this different from going to a nice murder mystery dinner theater? The food has nothing to do with Natasha’s storyline. In fact, it’s separated distinctively from the show itself (Food happens pre-show and during intermission.) Hold this in contrast to stealing a piece of candy from the witches’ candy shop at Sleep No More. Sure, a gumdrop pales in comparison to plates of chicken and salmon, but it becomes a much more interesting sensual experience a) because you are not being served the gumdrop, you are essentially ripping it from the set and b) the gumdrop is inherently part of the actual theatrical plot and tone. If I get some fish n’ chips in the lobby of Once, do I somehow connect more magically with the sharacters? 2) “Immersive” means that you’re surrounded by the actors (as opposed to watching them from afar) and doing things that they tell you to do to help with the storytelling. Was it cool to have actors dancing and singing inches away from me? Sure. Especially the good-looking ones. Does that make it immersive? Meh. Was it cool when the waiters handed out little egg-shakers to people in the audience during intermission and told us to shake them during the “Balaga” number and then when I forgot to, I got prodded in the back by some random ensemble member to remind me? Was that supposed to make me more excited about the song somehow? Again, immersive? Or just weird micromanaging? 3) “Immersive” means you have a contribution in the show’s progress so that it’s different every time. While it’s a nice thought, that doesn’t really happen in Natasha… unless me not shaking my egg-shaker will be detrimental to quite-adept band’s rhythm. Here’s what I’m trying to say: Natasha works at its best when it’s not trying to ‘immerse’ us in vague ‘immersive immersion-ness.’ Some shows are made for immersive experiences. They are usually the ones where there’s no real set-out plot, where theatregoers get a choice in what they do, what happens, and whether or not to steal that piece of candy. Natasha is a beautiful musical, beautifully-acted, and beautifully-choreographed. I actually regretted the parts when things like shaking my egg and who’s going to get that last piece of chicken interfered with my experience of the show. I CAN HAZ SOUNDTRACK PLZ?